“All things, including the grass and trees, Are soft and pliable in life; Dry and brittle in death. Stiffness is thus a companion of death; Flexibility a companion of life. The hard and stiff will be broken; The soft and pliable will prevail.” – Lao Tzu How soft and pliable is your body? How about your attitudes and ways of thinking? What if one was actually a reflection of the other? In this book, you now have an unforgettably simple yet powerful way to ensure you prevail in life, whatever comes your way. 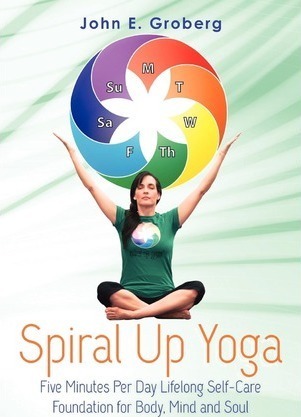 Spiral Up Yoga will teach you a simple five-minutes-per day self-care practice for body, mind and soul that combines the best of thousands of years of yoga with the author’s unique, illusion piercing clarity. Whether you’ve been wanting to try yoga but don’t want to deal with going to group classes or you already love yoga but don’t practice as much as you’d like, this book is for you. Even if you’ve never thought yoga was for you, this book is for you. Your experience of Spiral Up Yoga only begins with this book. Many resources, including online videos, supporting products and services as well as support and networking with a worldwide tribe of fellow practitioners are accessible at www.spiralupyoga.com. “There aren’t many ideas in modern day life that are truly and accurately described as revolutionary– but here, in this book is one. This book will reach people way beyond the subject of yoga. This book is bound to also become a classic in the category of personal growth and self-help.” — Steve Chandler, Author of Time Warrior (and 30+ other books) Spiral Up Yoga is based on many years of personal experimentation with yoga by the author, all with the goal of making yoga more accessible to the average person who doesn’t have hours a week to devote to going to yoga classes. The author’s personal quest was to create a simple, “impossible to forget” system that only requires a few minutes a day to practice, but would become a powerful foundation of complete self-care for body, mind and soul. Spiral Up Yoga is the result of that long quest. Practiced just a few minutes a day, Spiral Up Yoga will restore your body to it’s innate state of being flexible, supple and energized. It will restore your innate inner calm and peace of mind making you more resilient and less stressed. It will unlock your innate spiritual nature and creative spark as your soul is allowed to shine forth more brightly and you become more aware of who you really and are what you’re here to do. The structure is so simple. There are seven major chakras of the energy body and there are seven days of the week – Monday is First Chakra Day – Tuesday is Second Chakra Day – Wednesday is Third Chakra Day – Thursday is Fourth Chakra Day – Friday is Fifth Chakra Day – Saturday is Sixth Chakra Day – Sunday is Seventh Chakra Day Spiral Up Yoga is about doing something, no matter how small, each day to open and strengthen that day’s chakra. It teaches you lots of simple, effective ways to do that and allows you to create your own customized practice that can evolve and grow with you. Spiral Up Yoga also challenges many of your beliefs and ways of thinking about life which will create greater flexibility in thinking, not just in your body. This simple, 5 min/day practice will be one of the most incredible gifts you could ever give yourself and by extension, all those whose life you impact- because you will be offering a better version of yourself to all whose lives you touch.